There’s been much talk about the growing waste of clothing ending up in landfill, but what about the silent partner in this fast fashion boom…the coat hangers? The impact of the ever-present coat hanger is rarely mentioned in the statistics about clothing waste. It’s easy to overlook the hanger and what happens to it after you take the garment home. Alarmingly, there is even a trend of ready-hung clothes where the clothing arrives from the factory on a flimsy single-use plastic hanger that goes home with the garment. Yes, many of us have wardrobes full of re-used, second hand hangers we’ve accumulated from dry cleaners, stores closing down and dumpsters. But, billions of hangers still end up in landfill around the globe every year, mostly via stores throwing them out. Back in 2008, Treehugger reported that “over 8-10 billion plastic and wire hangers are sold each year, with only 15% ever being recycled.”(1) That’s because they are almost impossible to recycle, often made from multiple materials that need to be disassembled before recycling. Even with the steel wire hangers that could be recycled, most Councils ban them from kerbside recycling because they get caught in the machinery. It is another case of our society falling for cheap disposability—items that are so low cost they are not worth the trouble of handling, re-using or repairing. And yet, those items required precious finite resources to be manufactured, and cost our planet much more in terms of pollution. The dry cleaning system of giving a new wire coat hanger every time a garment is cleaned is not a sustainable design. Each garment only needs one hanger for life, not a new one each time it is cleaned. We all love these free hangers, but are they really free? Everyone pays for them in the dry cleaning bill; plus, every manufactured item has environmental and social costs that are rarely factored into the consumer price. What can you do to stop coat hanger waste? 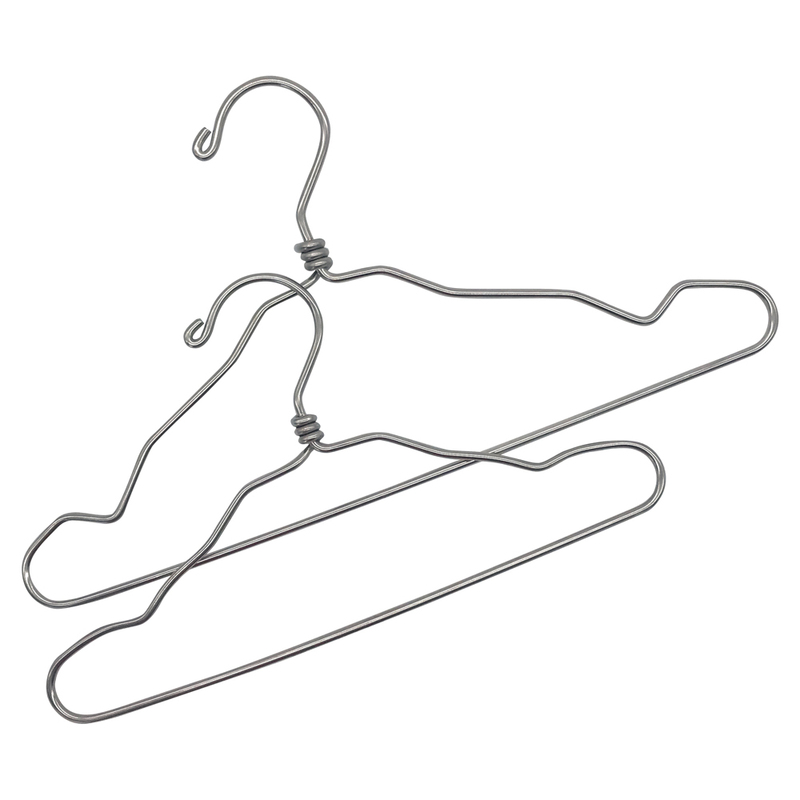 Before buying new coat hangers, try to source second hand ones on share sites such as Freecycle, charity stores, and Biome’s Coat Hanger Exchange as you can read about below. When you purchase clothing at a store, be sure to ask what they do with their hangers. Letting the business know that you care will send a message to pay attention to any waste. With dry cleaning hangers, always return them to the dry cleaners. As long as we keep retaining a new one each time, the demand will never reduce and they will keep manufacturing to fill the demand! Perhaps someone will implement a “Hanger Deposit Scheme” where dry cleaners use a longer-lasting quality hanger for which customers pay a small deposit that is refunded when returned, or swapped for another. For those needing to buy a new hanger, Biome has designed a strong stainless steel coat hanger that is made to last for life—in fact, you will be able to hand it on to the next generation. It is made from one piece of 50mm diameter 304 grade stainless steel. The solid stainless steel wire is wrapped around the neck (no easy task with the thickness of this wire), rather than a join that on other metal hangers is usually soldered together. Those join or twist points are the weak spot where other hangers eventually rust or break. You also combine the hanger with our stainless steel pegs for hanging clothes and laundry. 1. Return dry cleaning hangers to the dry cleaners. The cleaners and the planet will thank you for the cost saving. 2. Post unwanted coat hangers on a share site such as Freecycle, Gumtree or Facebook Marketplace. 3. Donate to a charity or Reverse Garbage—but, please ask first if they want them, don’t just dump and run. 4. Ask around your workplace, friends and family if anyone would like your extras. 5. Check with your local Council if they will take any type of coat hanger at their specialist transfer stations / resource recovery centres. Our stores are already well known as a place to bring other hard to recycle items such as pens, toothpaste tubes and toothbrushes, and old CDs. Now we’re adding coat hangers to the list because they are certainly hard to recycle! It’s early days so we can’t promise how many hangers will be available when you drop in, but we’ll keep you updated on Biome’s Facebook. The coat hangers you drop off must be clean, no rust and not broken. For those who need hangers, you can take up to six hangers per person. *We do not accept dry cleaning hangers as they should be returned to the dry cleaners. 3 Responses to Hung up on coat hanger waste? Keep them in the loop. Is it possible to post coat hangers to the store or is it only available to drop off? Hi Melanie. Yes certainly you could. We understand not everyone may have somewhere close to home to give them to.